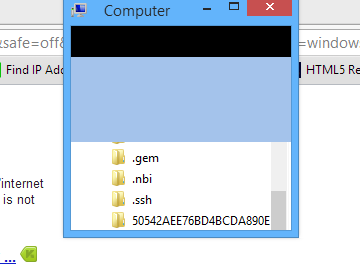 When resizing Windows Explorer on Windows 8 it crashes? The program Explorer.EXE version 6.2.9200.16384 stopped interacting with Windows and was closed. To see if more information about the problem is available, check the problem history in the Action Center control panel. What can be issue? Is there any way to fix explorer crashes? Or only way is reinstalling windows? My guess is that is related your video drivers/adapter. Start by upgrading the drivers for that to Windows 8 compatible drivers. Check to see if it happens in safe mode, that will more than likely tell you if it is a driver, as safe mode loads a generic driver. Try both the WDM driver and the official driver from the manufacturer of the video card. On this page: Gathering of Tweakers, a dutch IT forum someone has had the exact same error message, obviously without the details of the "problem history in the Action Center control panel" I can't really say more than that. If you provided that information we would probably have more to go on, or it might at least give some clue. After a fresh install I have another problem during the boot. The taskbar appears to be freezing and after clicking on it and then on the desktop it comes back after a few seconds. I can not find the cause of this... I strongly suspect it's a driver. But last day it was fine and there is nothing else installed. The last thing I did was the "Windows Experience Index" test. You see he notes the last thing done was the windows experience index test, maybe you did that last too? Other users of that forum have indicated it could be a driver issue, so try updating them as in the other answer. Something else worth waiting for is the hotfixes to be release when windows 8 is officially released, these kind of issues may be fixed then. Check if you have enabled extra panes like the preview or navigation pane in explorer. Simply reset your views to the usual Large Icons, Small Icons, Details etc and DO NOT select any navigation/PREVIEW pane. Once I disabled the preview pane, the explorer window could resize to the smallest size and stop flickering! Disabling the Preview Pane works, after which you are able to re-enable the Preview Pane and it still works. No need to check drivers, it's a crash state of Preview Pane trying to re-load the preview from before the crash and causing a loop. Not the answer you're looking for? Browse other questions tagged windows-explorer crash windows-8 or ask your own question.